Noodle shops specializing in Zhajiang Mian dot the city just like ramen noodle shops do in Japanese cities. Local residents look for the best versions and are fiercely loyal to their favorites. Everyone has their own special way of preparing it. Restaurant owners, or for that matter even home cooks, guard their recipes like treasures. So what is the secret to a good Zhajiang Mian? There is, however, an on-going controversy over what type of bean paste makes the best sauce. Diehard traditional Beijingers insist on using the “yellow bean paste (黃醬).” But other people think “sweet bean paste (甜麵醬)” is a better choice. Still others claim that “fermented bean paste (豆瓣醬)” is superior. To choose my favorite I conducted a taste test. I made a sauce from each of the respective pastes and created a fourth one with a combination of yellow bean paste and sweet bean paste. I rejected the fermented bean paste outright. The flavor was too overpowering with slight bitterness. It also creates a sauce that is a bit lumpy. When I told my Beijinger friend Robert Zhu, who is the proprietor of Lotus Blue Restaurant Bar, about my decision he promised to share his mother’s fermented bean paste recipe, which I will share with you in a later post. It is a dried shrimp sauce that he enjoys whenever he is home in Beijing. Tasting the other sauces I found the yellow bean paste alone produced a good rich texture but rather simple in flavor. Yet the sweet bean paste alone was too sweet for my taste. The combination of these two on the other hand resulted in a good balance of sweetness and texture with complex flavor and was my favorite. 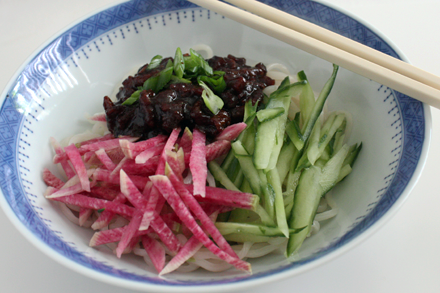 In addition to the sauce, traditional Zhajiang Mian is topped with julienned radish and cucumber. 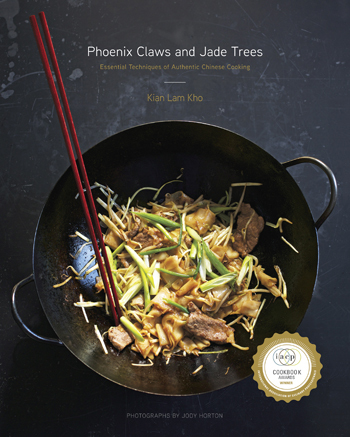 Contemporary cooks add other ingredients such as bean sprouts, green soybean (edamame), or carrots. Everyone else can continue with the battle over the merits of different types of bean paste but I think I’ve found my favorite. I like the compound sauce and I’m sharing my recipe with you. So make Zhajiang Mian with this recipe and let me know if it isn’t a much-improved version of a Beijing classic. 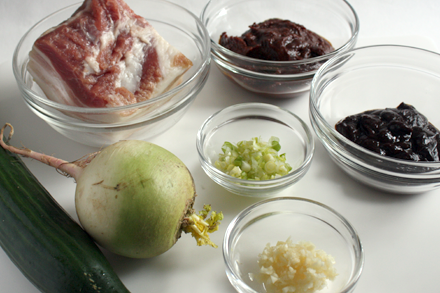 Cut the pork belly into quarter-inch cubes or julienne and set aside. 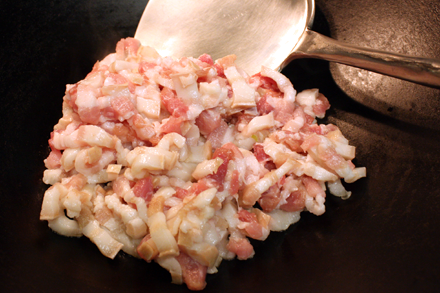 Cook the diced pork belly on medium heat in a wok until a small quantity of fat renders out. 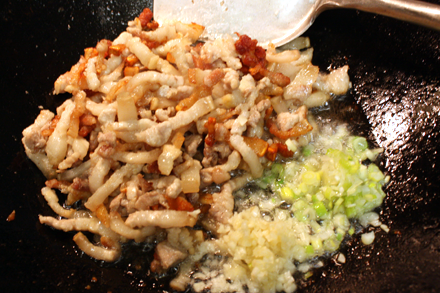 Add the minced garlic and scallion to the wok. Stir-fry the pork for another one minute or so then add the rest of the sauce ingredients into the wok. Turn the heat down to low and simmer for about 45 minutes. Stir the pork mixture occasionally to prevent the sauce from burning. It is ready when the sauce is reduced to a thick paste and the fat from the pork is bubbling. 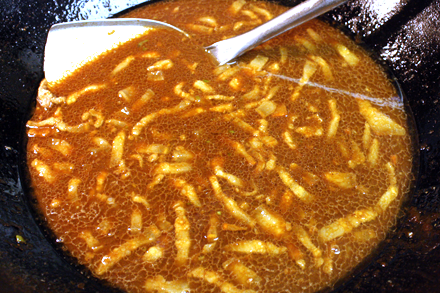 Just before serving bring a large pot of water to a boil and plunge the noodles into the pot while separating them. Bring the water back to a boil and immediately drain the noodles. Divide the noodles into four bowls. 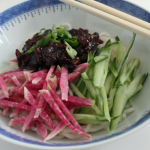 Separate the shredded radish and cucumber into four portions and place them on top of the noodles. Separate the meat sauce into four portions and scoop it on top of the noodles. Garnish with the sliced scallion and serve. 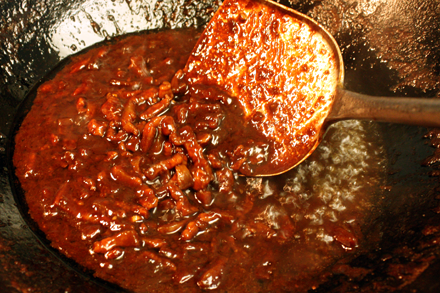 The sauce is very oily resulting from rendered fat of the pork belly. Although the Chinese prized the fat but you may want to scoop the meat and the sauce out carefully and discarding the extra fat. I love the idea of combining yellow bean paste and sweet bean paste, which gives you the best of both worlds! I like it with yellow bean sauce 黃醬, sweet flour sauce 甜麵醬, and chilli bean sauce 豆瓣醬! I adore the idea of using a combination of all three bean paste. I’ve been using a mixture of “yellow bean paste” and “sichuan spicy bean paste” because I like it slightly spicy. Oh yes, the diced pork belly is definitely irreplaceable with the low quality ground pork. thanks for sharing! I make my sauce with 2:1 ratio of tian mian jiang to dou ban jiang. Also, it’s important to “fry” or cook the sauce with a lot of oil to get rid of “tinny” and bitter flavors. Lastly, I find the brand of sauces you use make a big difference. Certain brands add proprietary ingredients to make their sauces more unique, which ultimately changes the flavor profile of your sauce. So I’d stick to a brand that I like and only experiment with other brands when you don’t have guests over. Awesome. I love the original Chinese version I had at a restaurant for the first time recently. I had the Korean version a few times while living in Korea and it is too sweet. It actually made me nauseous each time. Haven’t tried this yet, but the recipe is really famous. I would like to make it tomorrow, thanks.